Lead is a naturally occurring element found in the earth's crust. It is eternal; it cannot be altered; and it cannot be diluted. Like all elements, lead will exist forever, in the same quantity that it exists today and has existed since the beginning of time. Lead is a neurotoxin, so when certain quantities are absorbed by people, specifically young children, lead causes brain damage. Lead poisoning really is brain poisoning. The fact that lead is poisonous has been known for thousands of years, so it is truly ancient history. In the last hundred years, lead was most commonly known for its use in gasoline. Lead began to be added to gasoline in the 1920s to reduce knocking or pinging within internal combustion engines. Due to the harmful effects of leaded gasoline on people's health, as well as its negative environmental impact, leaded gasoline was phased out through various legislative efforts. Unleaded gasoline was introduced to the mainstream in 1974. 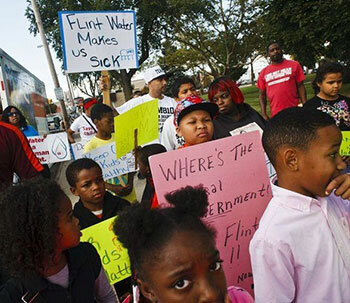 In Flint, Michigan, high levels of lead existed in the water from the Flint River, and now in the piping that carry's the water from the new water source. The water was and in some situations is still being consumed by thousands of people, including children, in catastrophic quantities that can only be classified as chronic exposure. HOW DO WE KNOW IF A CHILD IS LEAD POISONED? A simple blood test will indicate if a child has been lead poisoned. Such a test will reveal a "lead level." Lead is measured in micrograms per deciliter of blood. For years, the Centers for Disease Control ("CDC") defined childhood (under the age of 7) lead poisoning as 10 micrograms per deciliter of blood. This would commonly be referred to as a lead level of 10. The CDC has recently changed the definition of lead poisoning to a lead level of 5. So when we talk about micrograms and deciliters, what are we really talking about? 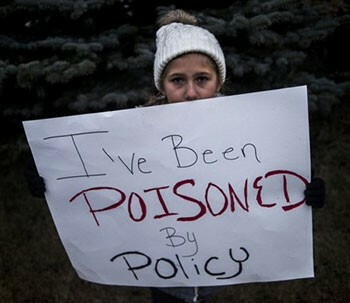 How much lead is really required to poison a child? The simplest way to make sense of it is to use a few real world examples to give a real world sense of how much lead and how much blood equates to poisoning. With that in mind, consider this: one single grain of sand has been compared to 25 micrograms. Because ten micrograms of lead per deciliter of blood constitutes lead poisoning, less than half of a grain of sand worth of lead per deciliter of blood is lead poisoning. So what is a deciliter? One deciliter equals 3.33 fluid ounces. A shot glass contains 1.5 fluid ounces. Thus, for a child to be lead poisoned, if you filled roughly two shot glasses with his blood, there would need to be less than half of a grain of sand worth of lead in the blood for him to be lead poisoned. Lead poisoning is a "dose/response" disease, meaning the severity of the poisoning is dependent on the amount of lead ingested and the length of time during which a child is exposed. Simply put, when lead is in a child's body, damage is being done to his brain, and the longer the lead is present in his environment and he is being poisoned, the more damage is being done. The extent of damage is also a function of the age of the child because the smaller the child, the less developed a child's brain and the more susceptible a child is to lead poisoning.